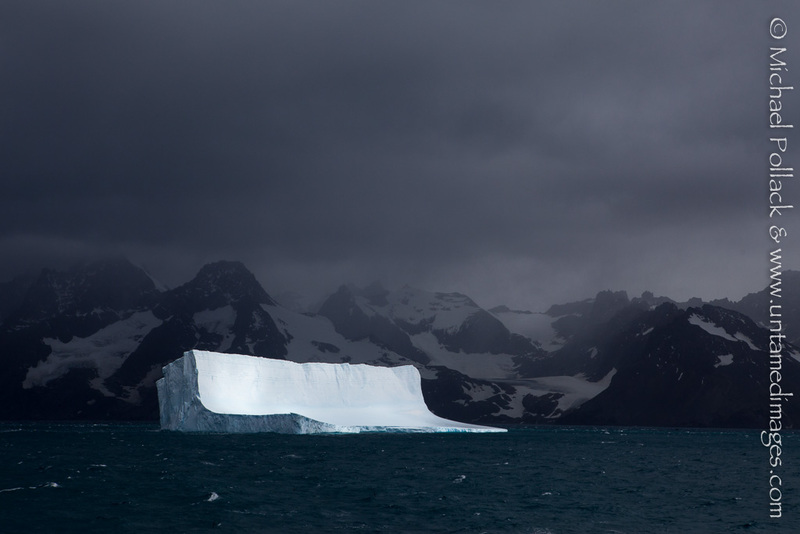 I watched and took several more photographs as the light on the iceberg faded and the winds escalated further. While gazing out on the scene in awe, I was treated to the sight of seawater being whipped airborne from a fairly flat ocean surface by intense gusts, which sometimes resulted in small rainbows appearing briefly. Before long, the ship’s captain closed all outdoor decks to passengers and I sought refuge from the fury of the elements. For five days while at South Georgia Island we had been blessed with almost freakishly calm and mild weather. That mild weather came to an abrupt end as we bid farewell to South Georgia Island and set sail for the Antarctic Peninsula. We would be in for a rough crossing, facing 70 knot sustained winds and 90 knot gusts. At times, the ship’s forward progress was slowed to just over 3 knots — a daunting prospect considering the Peninsula was nearly 800 nautical miles from South Georgia! While extreme weather often brings travel delays and sometimes seasickness(! ), it also has a tendency to create dramatic photo opportunities. This photograph would not have been possible without the nasty weather our expedition endured that day. I briefly considered naming this photograph Silver Lining, since it was literally the beneficial consequence of dark clouds, but decided it would probably be too much of an inside joke. Cool, scary, beautiful……but so cool!! So glad you like it. Thanks for commenting! Well, it could have been our little secret, but now it’s too late since you’ve outed yourself! Your photos are simply amazing! How in the world do you do it? I don’t know much about that art of photography but it’s clear to me that your photos are quite special. Amazing talent! Thank you so much for your kind words. You made my day! Really awesome photo. Looks like someone abandoned a “half-pipe” in the ocean 🙂 Kudos to you for braving the elements to get this shot. Thanks for sharing.